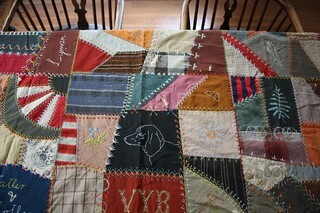 Bought this quilt at an estate sale in Kansas City, Missouri. I believe it originated in Missouri, as I also bought an old survey map of Black Creek, Missouri at the same estate sale. it's in rough shape. I'd give my right arm to know who made it....I'd love to find the family archivist, a descendant of the woman who made this beautiful quilt. Until then iIll treasure this weary beauty.